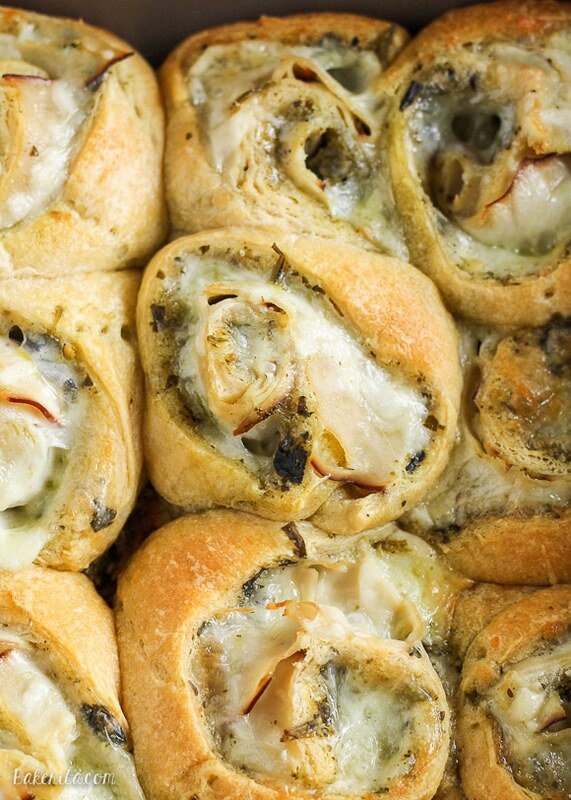 These Cheesy Turkey Pesto Rolls make a great snack or appetizer perfect for tailgating or the holidays! 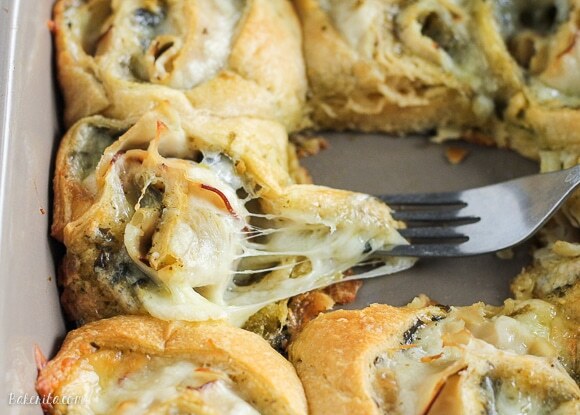 Gooey mozzarella makes this easy four ingredient recipe absolutely irresistible. I don’t think things get much busier than they do during the holidays. It seems like everything is hustling and bustling, with holiday shopping for everyone on your list, kids out of school for the holidays, holiday parties galore, and of course…tons and tons of food. Food is one of the cornerstones of the holidays, with our meals being where we all come together to celebrate each other and get really, super full. I don’t know about you guys, but my family is always in a major food coma after every holiday meal, and the food all seems to disappear oh so much quicker than it took to come together. While the holidays are definitely one of the times to slave away in the kitchen, I think it’s important to also squeeze in family time. Not every minute needs to be spent cooking, so when shortcuts can be made without sacrificing quality, I’m all for it. Appetizers are usually one of the places we get a little lazy for the holidays in my family. Usually a cheese plate and some chips are lying around, but it’s always fun to have a warm appetizer to pass around. Points scored if it’s cheesy. Even more points scored for easy. Thankfully, the appetizer I have for you today scores a lot of points. 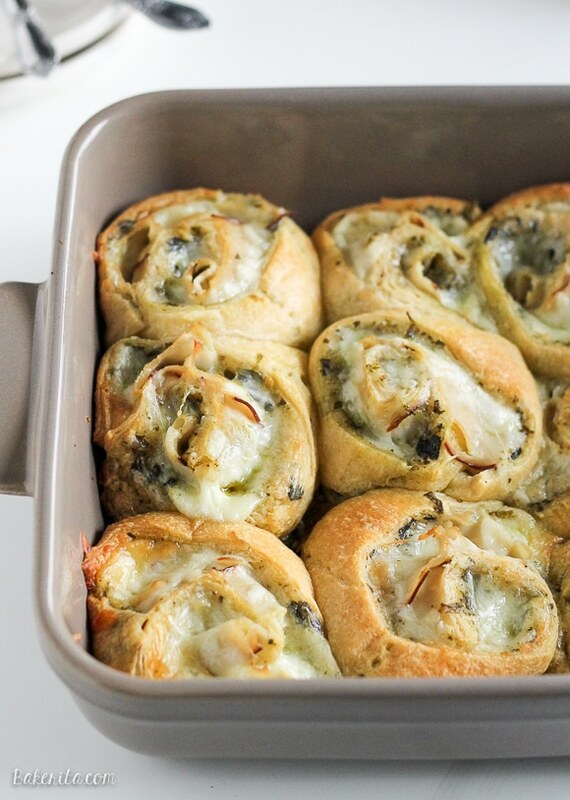 These Cheesy Turkey Pesto Rolls have only four ingredients and will be the perfect Thanksgiving appetizer, or tailgating snack for the next game! 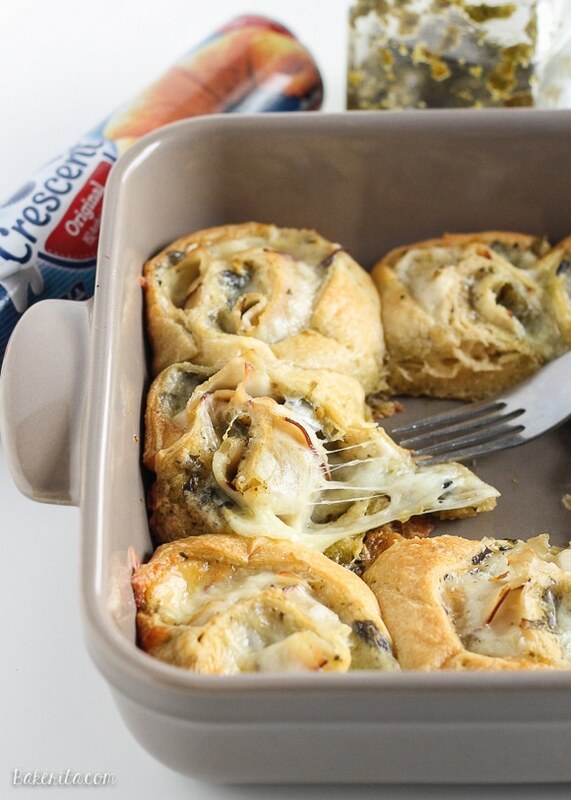 They’re almost too easy thanks to Pillsbury™ crescent rolls. I picked up a tube at Safeway and had such a hard time deciding to make with them. 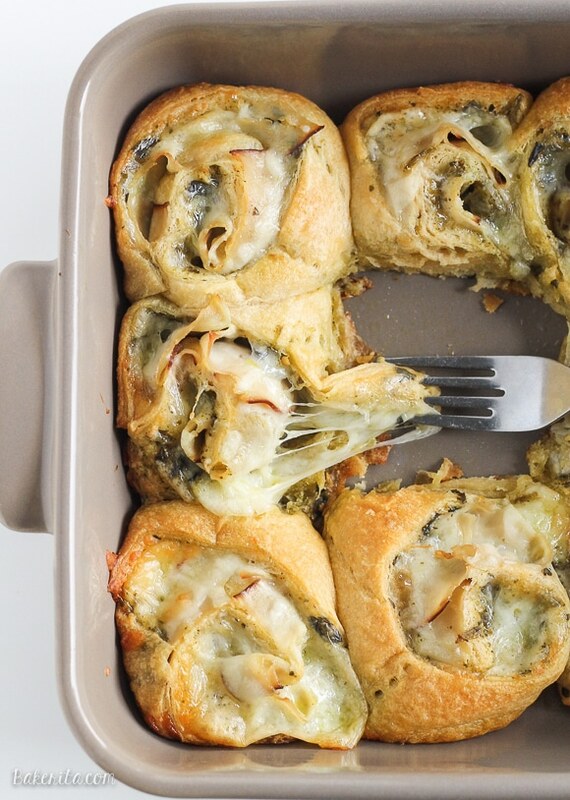 There’s so many delicious things you can do with crescent rolls, but I’m definitely glad I went with these rolls. Because the crescent rolls are meant to be pulled apart, they do have the seams. For these rolls, we don’t want those seams. Thankfully they come out quickly if you roll over them lightly with a rolling pin or press them together with your fingers, just enough to make the rolls stick together, but you don’t want to make the dough too thin. After you have a cohesive rectangle, spread the dough with pesto, sprinkle with cheese, and lay the turkey on top. Roll ’em up, slice it, and bake till gooey and golden brown. These are best served warm, but if you have leftovers, they also warm back up deliciously in the toaster oven. I speak from experience.